The Quicker Ball Picker Upper . 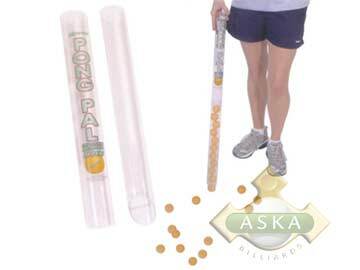 Pong-Pal will make it much easier and faster to pick up table tennis balls. With its special angled end, you can even retrieve balls that are under your table or other hard-to-reach places.Its unique two-piece design permits you to take it apart and carry it in your sport bag or Robo-Tote. Works with either 40mm or 38mm balls. Also ideal for wheelchair players who can use just the lower half and then place it on their seat or armrest to keep it handy. Whole tube holds twenty three 38mm balls; half tube holds eleven 38mm balls. Attach it to the side of table with the included Velcro strip so it's always within easy reach. Comes with 2 extra replacement bands.